Abstract: The Christopher Andrew Jones Family Papers contain clippings, correspondence, memorabilia, and other materials related to Christopher Jones, one of the 35 Syracuse University students killed in the bombing of Pan Am Flight 103 while returning home from studying abroad through the Division of International Programs Abroad (DIPA). Christopher Andrew Jones, a Syracuse University junior majoring in English and history, was returning to his home in Claverack, New York for Christmas. Chris graduated from Hudson High School in Hudson, New York in 1986. He was remembered by faculty and his fellow students as a well-liked young man, good student, and reliable friend with an easy sense of humor. Chris had played on his high school's varsity basketball team, tennis team, and soccer team. His love of sports, as an athlete and a fan, continued through college. At Syracuse, Chris was fondly nicknamed "Shrub" by his classmates, owing to his curly mop of hair. He wrote for the campus newspaper, The Daily Orange, participated in intramural sports, and was active with the University radio station, WAER. As an English major, Chris's favorite course was his short story class. His own stories were regularly humorous, inspired by his love for P.G. Wodehouse, Monty Python, and T.C. Boyle. 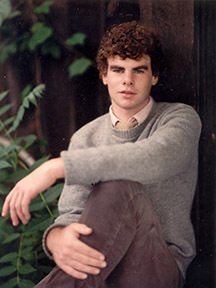 Although Chris had not settled on a definite post-college career, the plan outlined in his high school yearbook gives hints to the life he hoped to build: "College, Sportswriter for The Boston Globe, marriage upon retirement, spend final happy days in Boston Garden enjoying another Celtic dynasty." Chris was survived by his mother and stepfather, Georgia and Anthony Nucci; his father and stepmother, Kenneth and Jean Jones; and three stepsisters, Monica Nucci, Lisa Brittain, and Kim Matteson. Chris was predeceased by his sister, Jennifer Jones, who passed away in January 1988 while in Ecuador as an AFS exchange student. Georgia Nucci coordinated the publication of On Eagles' Wings, a book comprised of memorials and remembrances for all 270 victims of the bombing of Pan Am 103. Clippings contains articles about Chris, the bombing of Pan Am Flight 103, and other relevant topics. Correspondence includes subseries for Christopher Jones; his father, Kenneth Jones; and mother, Georgia Nucci. The Christopher Jones subseries consists of outgoing correspondence to Ken Jones, while the Kenneth Jones and Georgia Nucci subseries contain correspondence on various topics. These topics include legal correspondence, communications with Syracuse University, incoming correspondence from government agencies and officials, and correspondence with various victims' groups. Christopher Jones's Personal Belongings contains trophies, medals, and plaques awarded to Chris for his athletic achievements; his high school diploma; his Boston Red Sox baseball cap; and signed photographs of favorite teams and athletes. Photographs includes pictures of Christopher Jones, and the Tundergarth Memorial Room in Lockerbie, Scotland. Subject Files contain materials on various topics relevant to Chris' life, and the aftermath of the bombing of Pan Am 103. Included is a map of locations of the wreckage of Clipper Maid of the Seas, and an official copy of the Congressional Resolution establishing the Memorial Cairn at Arlington National Cemetery. Please note some materials in this series are restricted in accordance with the Federal Educational Rights and Privacy Act (FERPA) and Syracuse University policy. Writings is primarily dedicated to Chris's own short stories and essays, but also contains a brief tribute to his father, Kenneth Jones. Please note some materials in this collection are restricted in accordance with the Federal Educational Rights and Privacy Act (FERPA) and Syracuse University policy. Newsletters and programs related to the Remembrance and Lockerbie Scholars, Victims of Pan Am Flight 103, Inc., and Families of Pan Am 103/Lockerbie have been separated and placed in the appropriate collections. The Christopher Andrew Jones Family Papers were donated by Kenneth and Jean Jones, and Georgia Nucci between 2002 and 2013. The Christopher Andrew Jones Family Papers are fully processed. Materials are arranged alphabetically within each series with the exception of the Clippings series, which is arranged chronologically. RESTRICTED: Please note this file is restricted in accordance with the Federal Educational Rights and Privacy Act (FERPA) and Syracuse University Policy.